A big front yard perfect for games or climbing the old tree. 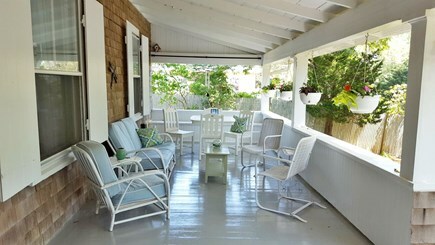 The front porch is a great place to gather, rain or shine! Front porch dining at its best! The open floor plan is perfect for bigger families. 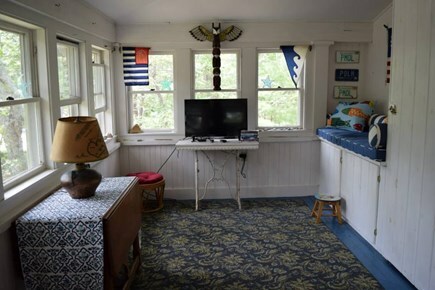 The game room gives kids a place to call their own. Bedroom 1 with en suite, first floor. Bedroom 2 with en suite, first floor. 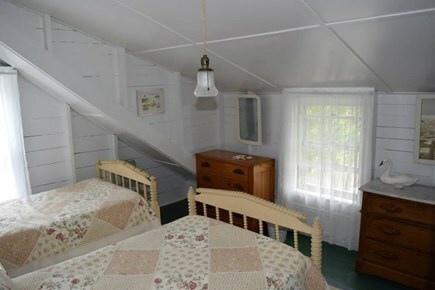 Bedroom 3 with Jack & Jill bath, second floor. 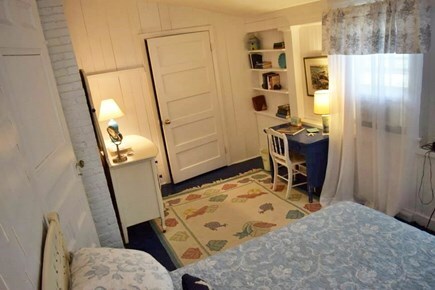 Bedroom 4 with Jack & Jill bath, second floor. Bedroom 5 with Jack & Jill bath, second floor. 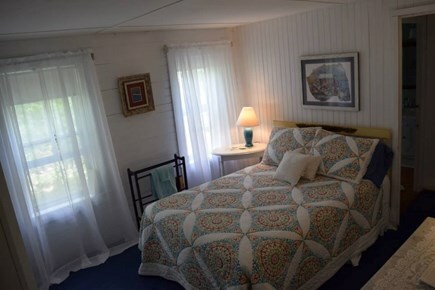 Bedroom 6 with king bed and Jack & Jill bath, second floor. 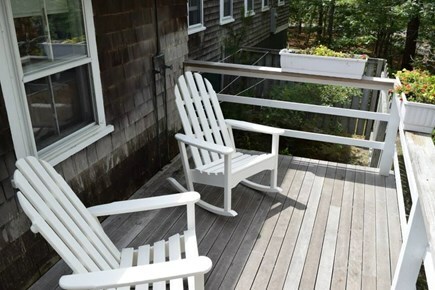 The sunny back porch is great for a morning cup of coffee. 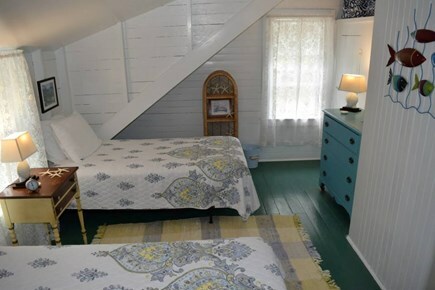 This antique cottage was once part of the Ahoma Inn. 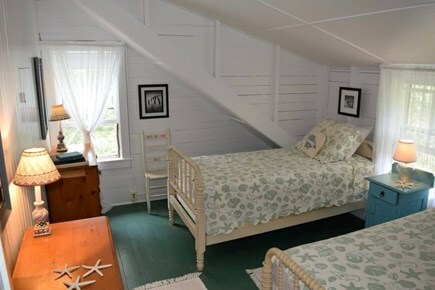 Its charming and spacious rooms include an open dining and family room area, a large farmer's porch overlooking a private yard, an enclosed sun porch and a sunny back deck. 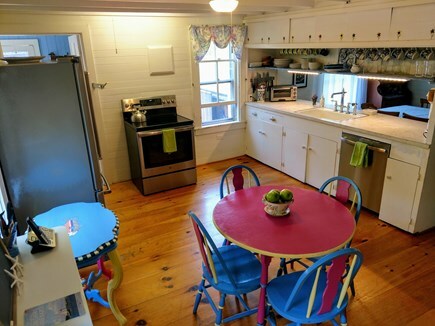 The kitchen is large and includes all major appliances, microwave, ice maker, coffee maker and all of the other supplies you'd expect. The outside shower is spacious and private - a visitor favorite! 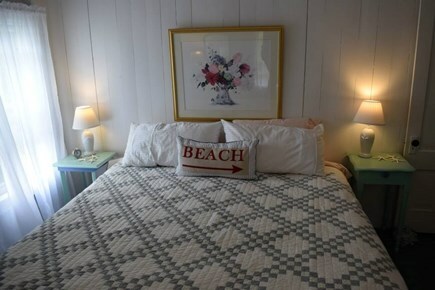 This house is quintessential cottage living at its best. There is a short flight of stairs up to both the front and back door. Once inside, first floor living is possible with two private bedrooms each with an en suite bathroom with easy-entry showers. Thanks for the kind words, Dave! We're so glad your group had a good time. We hope you'll visit again soon! I am an education professional and the third generation to be guardian of this wonderful property. My grandparents bought the house in 1970 after renting in the area for many years. 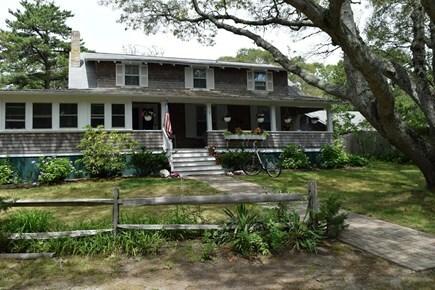 They loved the proximity to the sea and to town, and the character and charm of the house itself. We are thrilled to be able to keep the house in our family for generations to come, and to share it with you and yours as well. 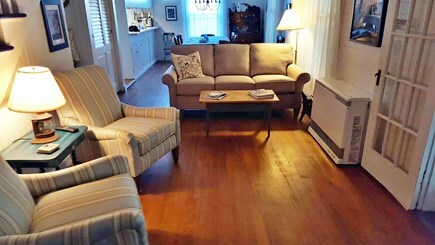 Visitors talk most about the wonderful front porch which is comfortable even in heavy rains. 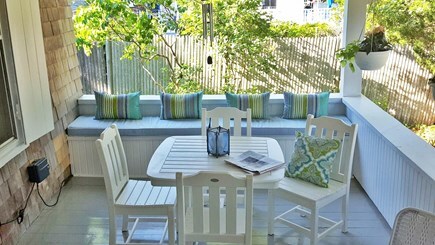 They also love the spacious outside shower and the way the clematis blossoms over its walls each summer. 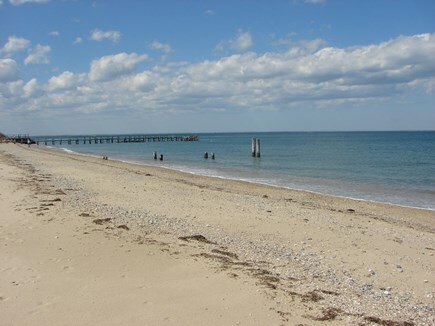 Its proximity to beaches as well as restaurants and shops in Oak Bluffs make it a great choice for families or anyone looking for a convenient way to tour the island.